Is your battery low? Don't worry, R2-D2 is here to power you up everywhere you go! 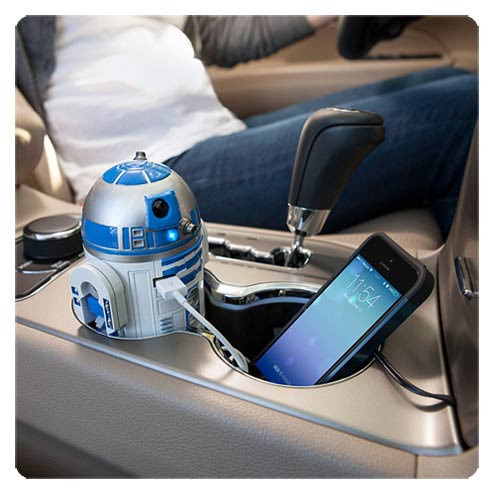 This little droid can not only charge your electronic device, he uses your vehicle's power to do so! While he is plugged into your 12V vehicle power adapter (cigarette lighter outlet), R2-D2 rotates his head back and forth, bloops and bleeps, and lights up, letting you know you are about receive 2.1 Amps through 2 of his convenient USB charging ports. This Star Wars R2-D2 Car Charger can charge up to 2 tablets, smartphones, or any electronic device that charges through USB and is small enough to fit in your vehicle's cup holder. This little guy measures about 5 1/2-inches tall x 3 1/2-inches wide x 2-inches in diameter to fit cup holder and comes with a charging cable that measures about 36-inches long. Ages 13 and up.